Bucket Drip Setup, originally uploaded by espeedy123. 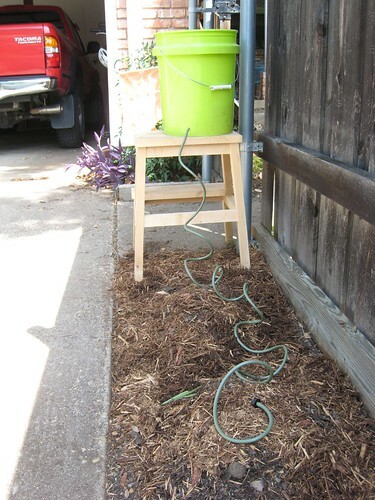 I started researching drip systems because I’d like to attach one to my rain tank for my raised vegetable garden. 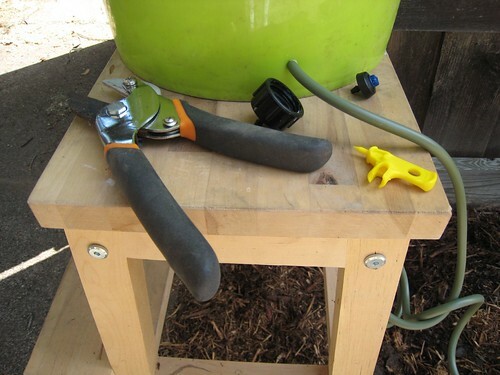 There’s all sorts of great information about gravity drip systems on the internet, including these plans for a simple bucket setup. I decided to try out this bucket dripper first as a dry run before getting into the bigger project. 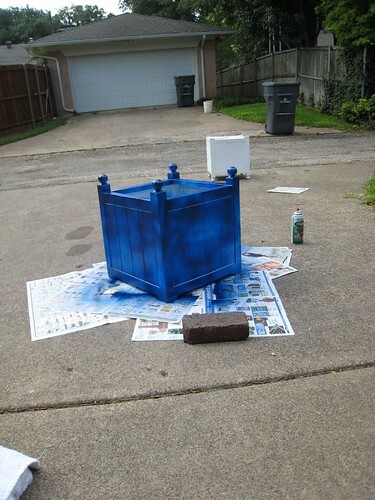 It’s really fun because it costs very little and doesn’t require a ton of tools. I used a regular drill to put a 7/32″ hole at the bottom of an extra bucket I had, and I used a blow dryer to soften the 1/4″ tubing enough that I could squeeze it in the bucket. Amazingly, that connection isn’t leaking. I put the reservoir on top of a stool I find too chunky to use inside the house that was just sitting out in the garage. 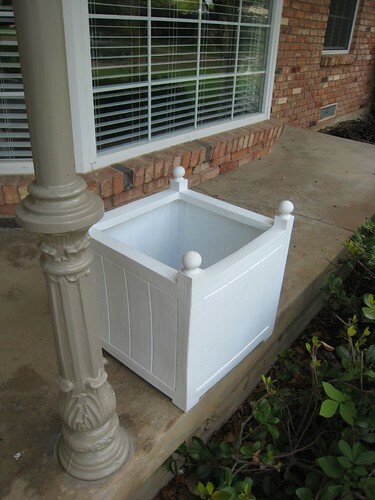 I plan to try to grow some gourds in this spot so we shall see how well this works. 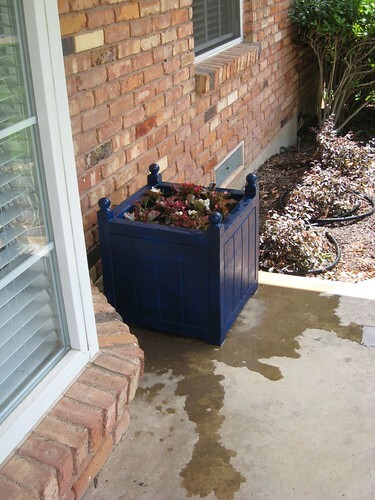 Check back for more later about the vegetable garden drip setup. If anyone has a great drip system set up, please comment!!! Erin’s U.S. Flag, originally uploaded by espeedy123. Today on the radio (570 AM, around 4:30 p.m.) my topic is the flag. 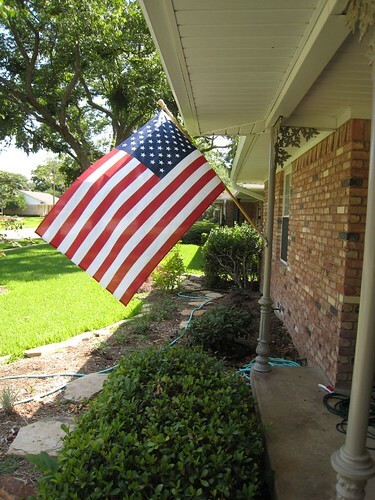 July 4 is less than 2 weeks away — is your flag setup ready?!?!? Do you know how to mind your P’s and Q’s with regard to the Stars and Stripes?!?! If you are new to flags, best not skimp on the flag hardware. The wind blows mighty hard, and it’s well worth getting the appropriate heavy duty bracket specially suited to wherever you’re putting it. I wanted mine to go on an odd skinny porch pole, and it took some hunting to find this bracket online. It is working nicely thus far. 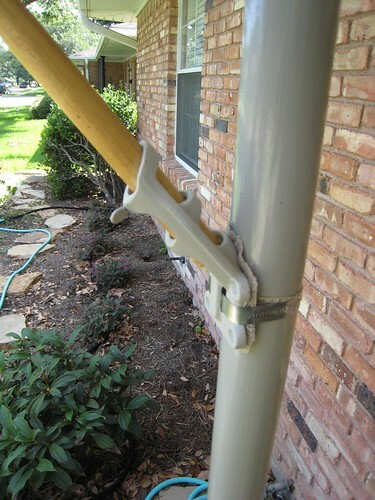 You can make a premium flag pole on a tight budget using a wooden closet rod. Here are some plans for an indoor standing one. It would also work directly in the ground outside for occasional holiday use, or in a bracket. My dad made a sharp looking pole from a wood rod that he keeps a high gloss finish on that goes in a bracket. Flag etiquette is all about respect of the flag. Avoid dropping it, letting it get drenched in the rain, or flying it in total darkness. The best place to find the info about rules and folding, etc., is the website of the American Legion. I wrote a short piece about flag etiquette for the paper that will run July 4, and the Legion flag expert I interviewed said etiquette is especially important during wartime. In such a stressful time for military service members and their families, it does make sense that we should be more aware of the flag. 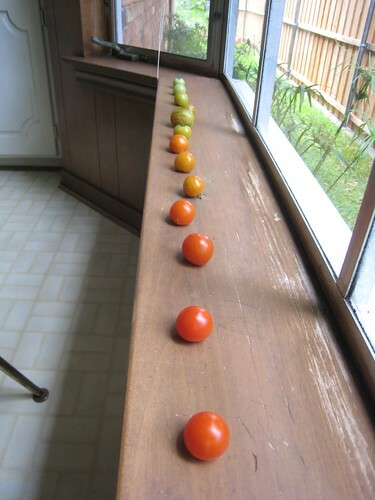 Tomato Runway, originally uploaded by espeedy123. Is there any disappointment greater than finding the tomato for which you waited and worked and watched HALF EATEN BY A BIRD!?!? This sad situation has deflated me more than once. Solutions I have heard about include creating physical barriers like nets, hanging fake snakes, and tieing old CDs near to the plant to blind the birds with sunlight. The net sounds like a lot of trouble, and I doubt the effectiveness of fakery. The grackels around here seem smart and plentiful. I heard about my solution on the Neil Sperry radio show. Am I allowed to love the Dirt Doctor and still respect Neil??? 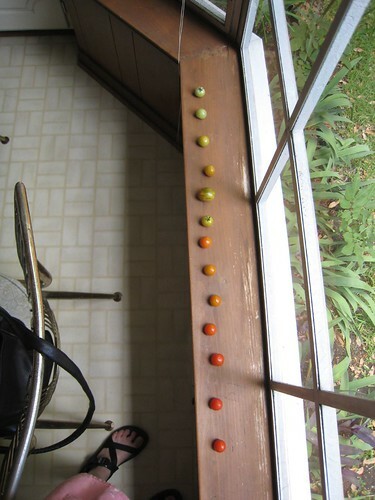 He suggests bringing the tomatoes in just as they start to turn and letting them ripen on a sunny windowsill. So far this has worked out great. They seem to turn red in a day or two. These photos are from a week or so ago and I have around 40 newer ones out there now, mainly from a single “Husky Red Cherry” tomato plant. I have been eating a cherry tomato and cucumber salad every day. I imagine they do not taste quite as nice as straight off the vine, but if I don’t wish to share with the birds this is the best I’ve figured out thus far. Does anyone else have suggestions for keeping birds out? 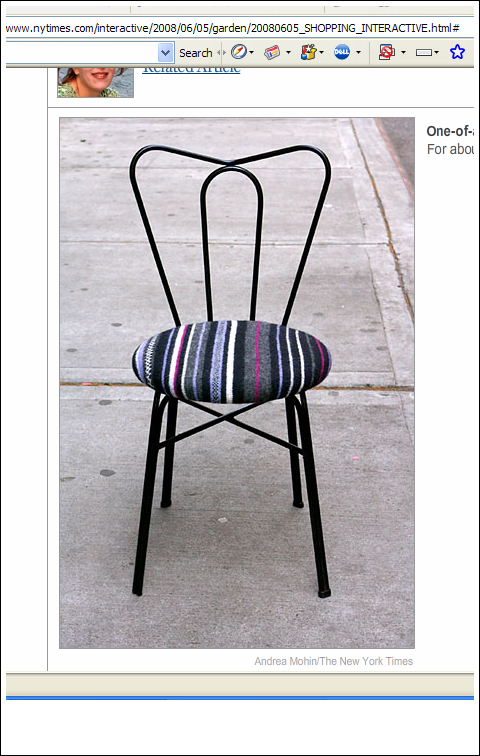 I give her extra points for accomplishing this on a city street and for making the comment that she avoids heavily upholstered pieces to keep from getting bedbugs.